The JBL PRX412M passive loudspeaker kicks off JBL's fantastic line of PRX400 speakers. It's a true 2-way passive speaker, with a custom-designed JBL MB112-8 305mm (12-inch) woofer holding down the low end. Its highs sing from the JBL 2414H-C 1.5-inch polymer diaphragm compression driver. The PRX412M handles 300 watts of continuous power and 1200 watts peak, with a 126 dB maximum SPL. It has a frequency range of 50 Hz - 20 kHz, and a response of 62 Hz - 19 kHz. 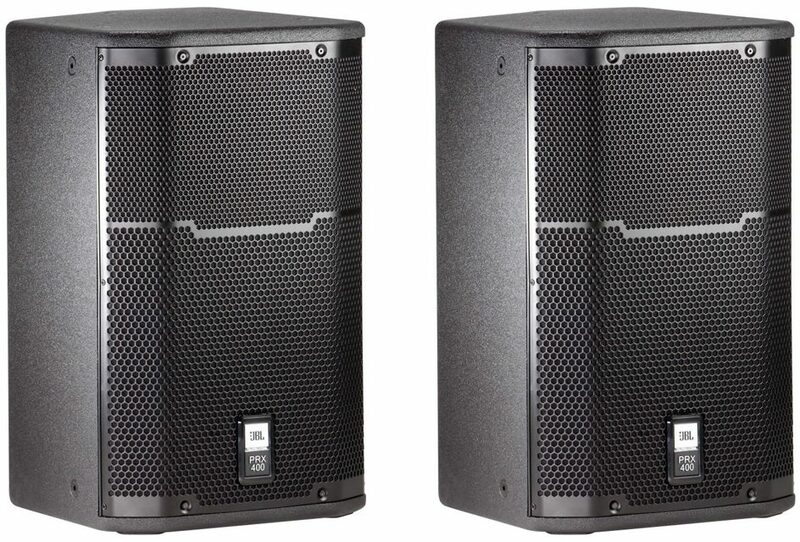 At this price point, the JBL PRX412Ms make excellent on-stage monitors or utility speakers. JBL PRX412M loudspeakers come equipped with parallel Neutrik Speakon combo inputs that handle both Speakon NL-2 and 1/4" sources. The PRX400 speakers come with integrated SonicGuard technology that does an excellent job of protecting the HF driver from inadvertent overpowering. In such a situation, an internal attenuator matches the higher sensitivity of the high-frequency driver to the lower sensitivity of the low-frequency driver, thus balancing the HF and LF output. When the input signal increases, more current passes through, causing certain elements to increase in temperature. The growing resistance inversely effects a reduction of the signal going into the HF driver, protecting it from overload. When the elements cool, normal system operation is restored. The tops of all PRX400 enclosures are constructed from with 25 mm sheets of poplar plywood that are uniquely strong given their light weight. The sides are made from 18 mm birch sheets, ensuring a cabinet with a great natural throw. They have absolutely no boxy or buzzy cross-resonance, even when you're pushing the volume all the way. The deep-cup tongue and groove joints ensure a cabinet that will endure the rigors of transport. The cabinets are finished in JBL's own obsidian DuraFlex finish, while the speakers inside are protected with a dent-and-scratch-resistant 16 gauge steel. The M10 suspension points, rated to hold up to 1000 pounds, are constructed from 14 gauge steel. JBL's PRX400 series speakers include a single 35 mm pole socket with dual mounting angles that allow the speaker to be mounted vertically, or angled 10 degrees downward to better cover the audience. The cabinets are also constructed in a trapezoidal shape that makes them reliable and sturdy floor monitors. The ergonomic handles are made from lightweight glass-filled nylon, and feel great in the hands when you have to schlep them around. Note: Unpowered speaker, requires separate power amplifier. zZounds is an authorized dealer of JBL products. - Dimensions (H x W x D): 22.7" x 13.9" x 15.75"
- Net Weight: 38 lbs. The JBL PRX412M is a portable, twelve-inch, two-way speaker system designed for either main sound reinforcement or monitoring applications. 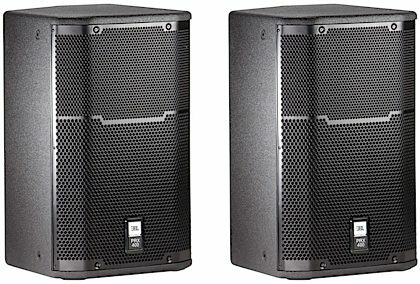 JBL PRX400 passive speakers were designed to provide the sensitivity, frequency response and power handling needed to address a multitude of demanding audio environments while still being reasonably priced. For musicians, DJs, Houses of Worship, public address, or suspended in a commercial environment like a school or nightclub, they can be used with a powered mixer or a full rack of amps and signal processing, delivering the sound power and bandwidth necessary to make loud music sound natural and even quiet speech intelligible. Comprised of tour-tested JBL components in rugged enclosures with professional connectors and suspension points, this 2-way speaker tackles tough jobs affordably and professionally. - SonicGuard(tm) protects the high frequency driver from excess power without interrupting the performance.